Pitching mechanics instruction is broken. Pitchers are being coached out of the things that dominant and durable pitchers do. Things that Justin Verlander, Mariano Rivera, Nolan Ryan, and Tom Seaver actually do. Pile on top of that rising levels of risk-taking encouraged by the (mis)perception that procedures like Tommy John surgery are completely safe and effective, and may even boost a pitcher's performance, and you have The Epidemic. The difference in how dominant and durable pitchers and modern, hard-throwing but far more injury-prone pitchers move is visible to the naked eye. While dominant and durable pitchers have exceptional Timing and consistently get to the Ready Position, modern pitchers increasingly exhibit problems like Flat Arm Syndrome and Premature Pronation. These differences explain why Matt Harvey and Jose Fernandez quickly experienced injury problems early on in their professional careers while Tom Seaver and Nolan Ryan were equally dominant and far more durable. The definition of proper pitching mechanics has changed. How pitching mechanics -- and, more fundamentally, throwing mechanics -- are being taught has changed. I'm not just talking about the Inverted W, although that is increasingly, inadvertently, and again becoming an important and relevant topic. Instead, I'm talking about all of the different problematic pitching cues and drills that "work" by creating a Timing problem. There's no question pitchers at all levels are throwing harder than ever. However, the latest research into pitching mechanics suggests that these changes to how throwing and pitching are taught are contributing to the rising injury rates to pitchers. To fix the problem with how pitching mechanics are taught, and reverse the course of the pitcher injury and tommy john surgery epidemic, we first need to understand how things have changed in terms of throwing and pitching mechanics and how they are taught. I was able to watch Nolan Ryan, on TV, if not in person. ...and Mariano Rivera and his cutter. The more I studied pitchers and pitching mechanics, the more obvious it became to me that modern pitchers looked -- and moved -- differently than the pitchers I idolized and studied ad nausaeum. Mark Prior and his pitching mechanics were part of it, but he wasn't the only one. Living in St. Louis, Anthony Reyes quickly caught my eye due to his pronounced -- even worse than Mark Prior's -- Inverted W.
...but there seemed to be fewer and fewer pitchers who displayed the pitching mechanics of the greats. 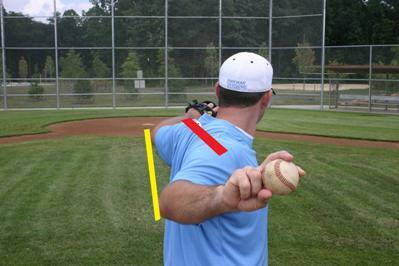 As I discuss in my analysis of Matt Harvey's pitching mechanics, in my opinion the root cause of Matt Harvey's elbow -- and eventually, shoulder -- problems is something called the Power T. If you got here by Googling "pitching mechanics," "proper pitching mechanics," or something similar, you likely came across a piece with these two pictures illustrating what are (supposedly) proper pitching mechanics. 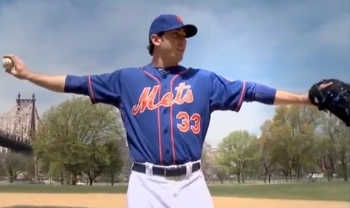 I assume that Matt Harvey was taught something similar. The problem is that the Power T works by creating a Timing problem; the pitcher's arm isn't up and in the correct position when their front foot plants and their shoulders start rotating. The Power T works -- for a while -- by overloading the arm; by pushing it past the red line. That will often yield quick velocity increases but, in my experience, will also lead to elbow and/or shoulder problems. I believe that people who teach the Power T think they are teaching pitchers to throw like Roy Halladay. My analysis of Jose Fernandez's pitching mechanics discusses my belief that other common cues are compromising his pitching mechanics and are putting his career in jeopardy. ...unfortunately proved to be the most accurate, which suggests that the problem with Jose Fernandez's pitching mechanics is extremely serious. 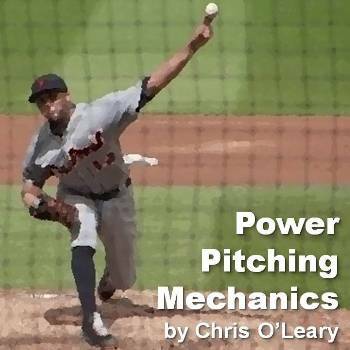 I have put together a number of free and other pieces for people who want to dive into the topic of pitching mechanics. Since 2006, I have been making predictions about which pitchers I think are more, and less, likely to experience injury problems. I mention this because I believe it establishes that I have a deep understanding of pitching mechanics and injuries; you have to understand a system in order to make accurate predictions about it. 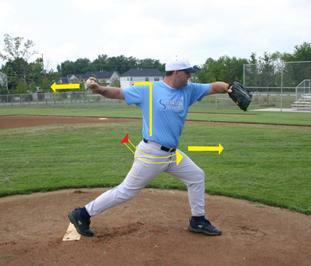 As a result of the research I have done into pitching mechanics, I have put together a number of ebooks, webbooks, and streaming DVDs that discuss the topic of proper pitching mechanics and how to develop them. In an attempt to reverse the trend of rising injuries to pitchers, I have put together a webbook that discusses what I believe are the root causes of the pitcher injury epidemic. It is called, simply, The Epidemic. The Epidemic gives my view of what is happening, why, and what coaches, parents, and physicians can do about it. In order to ensure that everyone who wants to read The Epidemic can do so, rather than charging a fixed amount for it, I have made The Epidemic available via a Pay What You Can pricing model. That means that everyone can read most of The Epidemic, regardless of your ability to pay. All I ask is that you remember that I have spent years researching and putting The Epidemic together, and my family and I would appreciate it if you would pay what you can for it. While people can, and often do, go into excruciating detail about pitching mechanics, at the end of the day pitching is just throwing with less margin for error. As a result, the way to learn to pitch well is to learn how to throw well. To that end, I have put together Throwing Mechanics 101, a webbook that explains the keys to teaching throwing. Finally, just as there are some things a pitcher should do, because they will improve your ability to throw hard and well, there are some things a pitcher should not do because they increase the risk a pitcher will injure himself. Unfortunately, many of these things are taught by many well-meaning, but ill-informed, pitching coaches. Pitching Mechanics 101 discusses what to teach pitchers and, just as importantly, what not to teach pitchers. ...as well as access to my Pitching Mechanics 101 DVD and MUCH more.